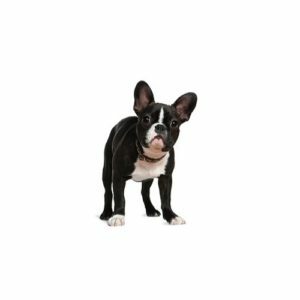 Truly an “All-American” dog, the Boston Terrier is a lively and highly intelligent breed with an excellent disposition. Conveying an impression of determination, strength and activity, he is short-headed and compactly built, and must be black, brindle or seal with white markings. Following the Civil War, the Boston Terrier breed was developed in the stables of Boston, Massachusetts, as a fighting dog. An imported dog known as “Hooper's Judge” (sold to a Boston man in 1870) became the ancestor of almost all true modern Boston Terriers. The breed is an American creation, resulting from a cross between an English Bulldog and a white English Terrier. In 1891, the breed became known as Boston Terriers, taking the name of the city where they originated. The Boston has been nicknamed “the American Gentleman” because of his dapper appearance, characteristically gentle disposition and suitability as companion and house pet. They require only a moderate amount of exercise and a minimum amount of grooming. The breed is easy to train and they are easy keepers, preferring to remain by their owner?۪s sides. Non-Sporting Group; AKC recognized in 1893. Do you think the Boston Terrier is the right breed for you and your family? Check out our available puppies page to see all of our Boston Terrier puppies for sale! Are you interested in purchasing a Boston Terrier?